Q: How do you compare the APM One-Step Embedded O-ring Self-Sealing Fastener System to the concept of just adding an O-ring or washer to a standard screw or bolt? A: When using just an O-ring or deformable washer (regardless of material) as a pressure sealer you sacrifice the ability to fully clamp, plus the degree of thread sealing is not predictable. That's because the O-ring or washer interferes with achieving 360° metal-to-metal contact between the underside of the head and mounting surface. Q: How do you compare the use of liquid thread sealants and compounds to embedded O-ring sealing technology? A: Both technologies share the goal of high-pressure sealing, but that's where the similarities end. The APM O-ring washer design provides the user with a pre-assembled, one-piece fastener, ready to be installed in one step- eliminating the dependence of the installer to apply the correct amount of sealant/compound. Its inherent geometric chamber and nested O-ring creates the perfect solution for maximum sealing and service reusability which is the result of a unique patented asymmetrical-shaped chamber. Sealants and compounds do not allow for easy replacement. They usually require the screw or bolt to be drilled out for replacement which can be problematic. They are really intended for one-time use. 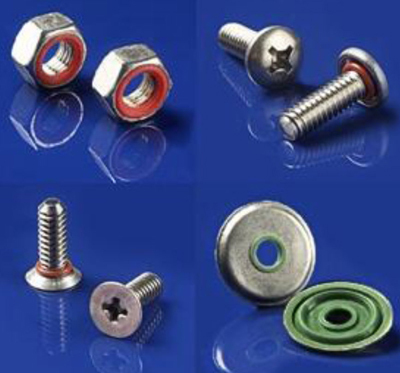 Q: How often can APM self-sealing fasteners (screws, bolts, nuts) be used? 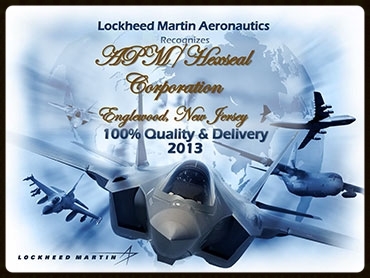 A: The APM design and patent (U.S. patent no. 3,175,454) was conceived to generate high-pressure fastener sealing to 20,000 psi and maximum multiple usage. However, this frequently asked question cannot be answered with a simple number because each application condition is different in terms of re-installation frequency, in combination with environmental and operating conditions. Because of the asymmetrical annular design, minimum O-ring friction occurs producing minimum wear which results in maximum reusability. Repeat orders from many customers confirm satisfaction from their field servicing experiences. Q: Besides being pre-assembled is there anything special about these O-rings and the asymmetrical chamber they reside in? A: Yes. 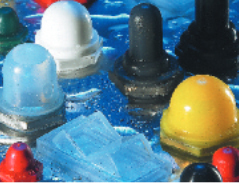 A special silicone formulation is used that is resistant to salt water weather, dust, dirt , sunlight, ozone and most acids, prolonging frequency usage and life of these special self-sealing fasteners. They have a temperature range of -100°F to +500°F (-73°C to +260°C). The ring size is also special and are not commercial standard O-ring sizes. This is important, because they have to be fabricated to conform to the special (patent no. 3,175,454) curvature configuration for holding chamber to maintain minimum O-ring surface friction when torqued. (This is the essence of the patent approval which contributes to its reusability.) The process requires that only 20% of the O-ring surface be compressed and displaced into a defined clearance hole which completes the sealing action. By reducing movement and friction, the integrity of the O-ring surface is protected from unnecessary wear which would otherwise expose the ring to degradation from contaminants reducing its future ability to seal at maximum torque levels. 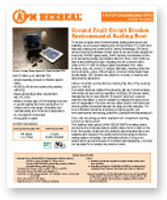 Q: Can the APM self-sealing fasteners be supplied with painted heads to match equipment color? A: Yes. We have a special bonding process which provides excellent paint adhesion. Q: Can thread locking be added to APM self-sealing fasteners? A: Yes. For example, you can order an APM SEELSKREW®, SEELBOLT® or SEELNUT® with a fully-adjustable, anti-vibration option. Choice of resilient engineered embedded polymer pellets, strips (bars), or standard/high-temperature, surface applied patches can be added to the threaded area for compression and locking action. Eliminates need for costly lock washers, cotter pins, or castellated nuts. Impervious to a wide range of chemicals, water and lubricants. Choice of locking materials. 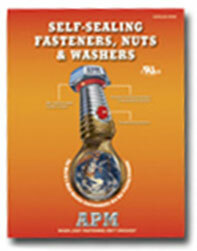 Q: I notice that APM SEELNUT® does not use an O-ring like your other self-sealing fasteners, and some competitor's nuts. How does it seal? A: After patenting the original self-sealing concept that incorporates an embedded O-ring within a groove of the head of the screw, bolt and rivet - APM designers soon recognized that an O-ring could not provide an optimized sealing solution for an effective -self-sealing nut. A standard nut's geometry combined with an O-ring, could not work as it does on these other fasteners. Part of the O-ring would be jutting above the nut and upon compression, would have insufficient room for expansion. So, APM designed a molded elastomeric insert, compatible with most gases and liquids (typically silicone), that could be easily compressed and locked into a contoured channel located on top of the nut as well as into the mating bolt threads. We also recognized that an effective self-sealing nut requires the sealing component to have threads that continue the nut's threads. This results in additional threaded surface for greater torquing and sealing capacity. The superior sealing design allows the SEELNUT® to achieve a 6,000 psi rating internal/vacuum - a feature that could not be accomplished with a pressed O-ring. UL Recognized APM SEELNUTS® are reusable and fully adjustable; they resist vibration and provide a 360° metal-to-metal surface contact, and are available in a wide range of sizes and materials. An optional thread-locking capability is also offered with the incorporation of a nylon pellet. 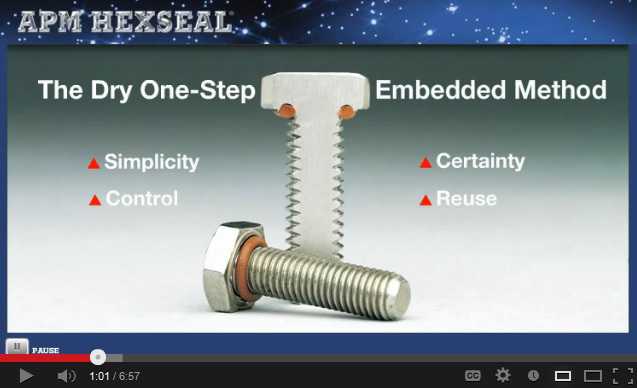 Q: Why is APM's self-sealing washer an ideal solution for NEMA type 4X/6 enclosure sealing? A: To its advantage, the APM UL Recognized SEELOC® washer looks and performs differently than any other sealing washer. This compressible stainless steel washer, with a bonded silicone seal, features two concentric ridges that function as a barrier-rib - one on the outside edge and the other on the inside hole surface making sealing contact with the mating screw/bolt shank creating a perfect high-pressure seal to 100 psi (internal/external). DSEI brings together the entire defense and security industry to source the latest equipment and systems,develop relationships, and generate new business opportunities.